Beets, Carrots, Turnips, Radishes, etc. 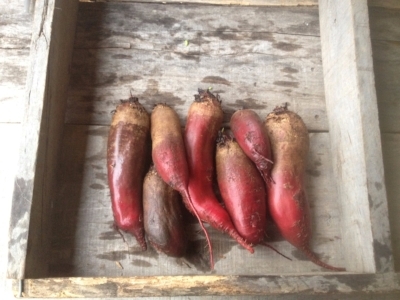 All of our root crops that once had leafy tops are stored best in a plastic bag in the refrigerator. They like high humidity and, if properly stored, can last up to 6 months! Carrots, turnips, radishes, and beets all make excellent pickles. They also make an excellent kraut, shredded and fermented. Pictured below: 5 lbs of carrots and 5 lbs of "Cylindra" beets, perfect for pickling. Edamame can be blanched and frozen. Sold "on the stalk" this can be a fun preserving project for kids. Simply pick off the pods, blanch and freeze whole. This is the best edamame you have likely tried. 3 lbs pictured. 3 lbs of edamame on the stalk.